Computer virus’s evident success in damaging Iran’s nuclear facility has officials asking if our own infrastructure is safe. 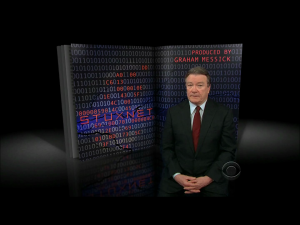 Steve Kroft reports. Graham Messick is the Producer. Coleman Cowan is the Associate Producer. For the past few months now, the nation’s top military, intelligence, and law enforcement officials have been warning Congress and the country about a coming cyber attack against critical infrastructure in the United States that could affect everything from the heat in your home to the money in your bank account. The warnings have been raised before, but never with such urgency, because this new era of warfare has already begun. The first attack, using a computer virus called Stuxnet was launched several years ago against an Iranian nuclear facility, almost certainly with some U.S. involvement. But the implications and the possible consequences are only now coming to light.